What can be done about damp in a chimney? Damp in chimneys is not unusual in the temperate maritime climate that we experience in the UK. High rainfall, temperature fluctuations and a large amount of older properties means that damp is not an unusual feature in our homes today. Also, it doesn’t matter if you use your flue for an open fire, stove, gas fire or boiler, you can still experience issues with damp. Chimneys and flues with their opening at the top of a property which can allow rainfall to enter are a common location for damp problems. Damp can manifest itself in a number of different ways – stained patches on a wall, mould and mildew on walls, dark or discoloured patches of plaster, lifting or peeling wallpaper, a musty smell or white powdery, salt-like substances on the walls. These symptoms of damp can appear at any time of the year. Why does a chimney suffer from damp? Chimneys can suffer from damp for a number of reasons – rainwater getting in, condensation and the presence of hygroscopic salts. Salts from the smoke that pass through the flue can be deposited in the internal masonry – this often happens in older properties where the fire would have been used regularly many years ago. As a result, the masonry builds up a level of salt which attracts moisture from the atmosphere through osmosis which causes damp to appear around the chimney. The effect of hygroscopic salts can be experienced whether the chimney and flue are in use or not; they can also be worsened if a flue has been made redundant by being sealed off at one or both ends without effective ventilation. Chimney stack – an open-topped chimney stack can allow rainwater to trickle down into a flue. An unused flue can be capped to stop rainwater from getting in – it has to be well ventilated though to prevent a build-up of moisture. Guttering – any guttering located near a chimney stack that is allowed to block up with leaves and other debris could overflow and cause water to run down the adjacent wall and enter via any cracks in the mortar work. Mortar – if the mortar used to seal the bricks of your chimney stack together is cracked or crumbling, water can enter the chimney. Lead flashing – the seal where the roof joins your chimney stack is covered with lead flashing. If it is coming apart or there are any cracks, this is a possible entry poin t for water. 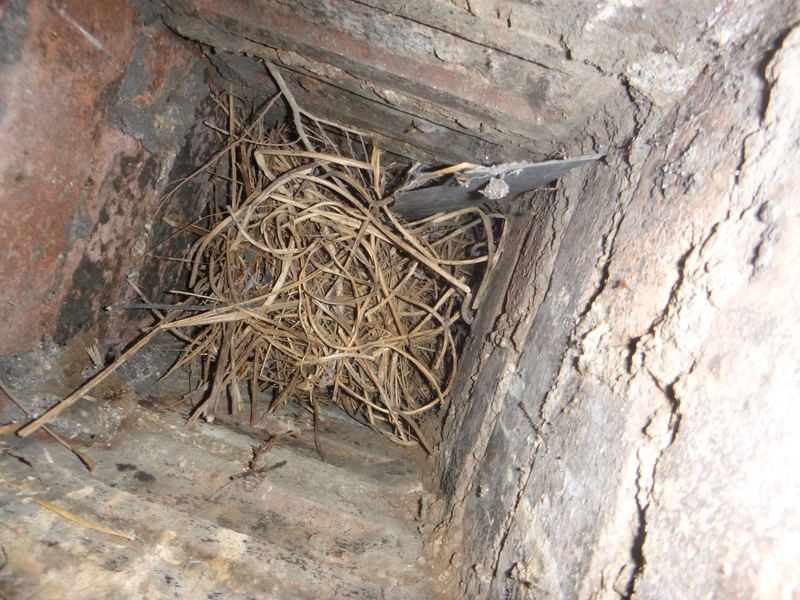 Blockage in the flue – anything in the flue that might prevent ventilation and also act as a sponge for water entering a flue such as a birds nest (as shown in the picture on the right) or rubble, can contribute to damp. Shared chimneys – It is not unusual for a chimney to contain more than one flue and each flue will serve a different fireplace. If you share a chimney with your neighbour, it would be useful to find out if they have had any work done to their flue which may have impacted on your flue. Identifying the cause of damp in chimney may not be straightforward. 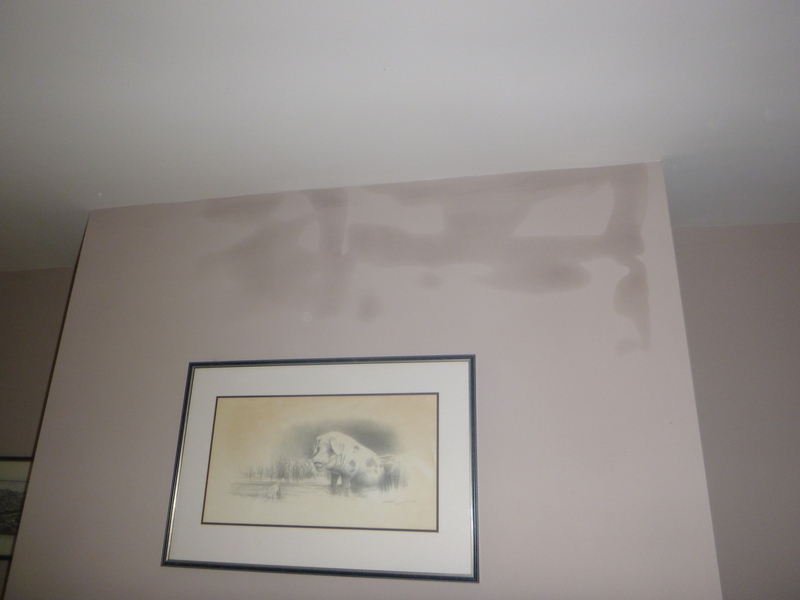 The signs of damp may only appear during certain prevailing weather conditions – e.g. a combination of wind and rain coming from a certain direction. Or it may be a combination of causes that are contributing to the damp – problems with lead flashing and condensation from a boiler for example. When is the best time to fix damp problems? It is always easier to establish the sources of damp in a property during the summer months when weather conditions are generally drier than the winter months. 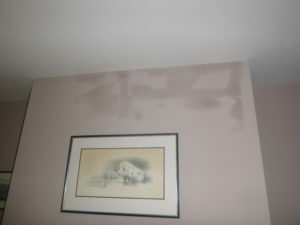 Tests can then be run to establish the causes of the damp. Trying to run tests for damp during the winter months when it rains more often and there is a higher level of moisture in the air makes finding the source of damp much more difficult. There are various things that can be done to reduce or eliminate the presence of damp in a chimney. Clearing any blockages in a flue and ensuring a suitable level of ventilation are both critical to maintaining a flue. Regularly reviewing the condition of guttering, mortar and lead flashing around a chimney will all be beneficial. If you would like to speak to us about any Damp Chimney Cheltenham issues that you might have, please contact us at info@turnerbaker.co.uk or call on 01432 839123.